Steven Soderbergh and his iPhone take us somewhere few have been before, behind the scenes of an NBA lockout. “High Flying Bird” which was picked up by Netflix at Sundance isn’t what you expect from the guy behind “Erin Brockovich” or “Ocean’s Eleven.” It’s not even in the same wheelhouse as “Unsane,” Soderbergh’s suspense thriller also filmed on an iPhone. Tarell Alvin McCraney’s script is quick-witted and sharp, which combined with Soderbergh’s unique editing style and creative editing choices almost make this film work. It’s the un-engaging subject matter that might put you to sleep especially for those not interested in professional sports or the procedural negotiations happening behind the scenes. It’s week 25 of the NBA lockout and Ray (Holland) is not only fighting for the players his company represents but for his own job. Ray has been in the business longer than anyone can remember, he’s the guy new players like recruit Erick (Gregg) want because there isn’t a deal he can’t close. Smarter than everyone in the room and usually a few steps ahead, Ray challenges his boss (Quinto) to watch how quickly he turns this lockout around. “The league is a business,” Ray reminds Erick, whose cat-fighting with another teammate on social media provides an opportunity to show the league exactly what type of press they are missing out on. Ray and his former assistant Sam (Beetz), who has her own ambitions, work the city and the decision-makers to make sure everyone gets what they want. "High Flying Bird" is neither exceptionally cinematic nor is it exceptionally entertaining. The film’s title comes from the first song we hear in the movie. “High Flying Bird” in an insular film that doesn’t make it easy for those without NBA knowledge to break through. This isn’t the first film to take a 72-hour look at a specific industry in crisis. “Margin Call,” “The Insider,” and numerous other sports films found a way to be both entertaining and cinematic while simultaneously educating the viewer on complex subject matters. “High Flying Bird” is neither exceptionally cinematic nor is it exceptionally entertaining. For Soderbergh’s part, his ability to create this world on an iPhone, and if rumors are true, finish a rough cut of the movie only 3 hours after principal photographer ended is extraordinary. It’s unclear though whether this fact should impress viewers or alarm critics. “Moonlight’s” Andre Holland and “Deadpool’s” Beetz are both playing very interesting characters that the film doesn’t make time to explore. 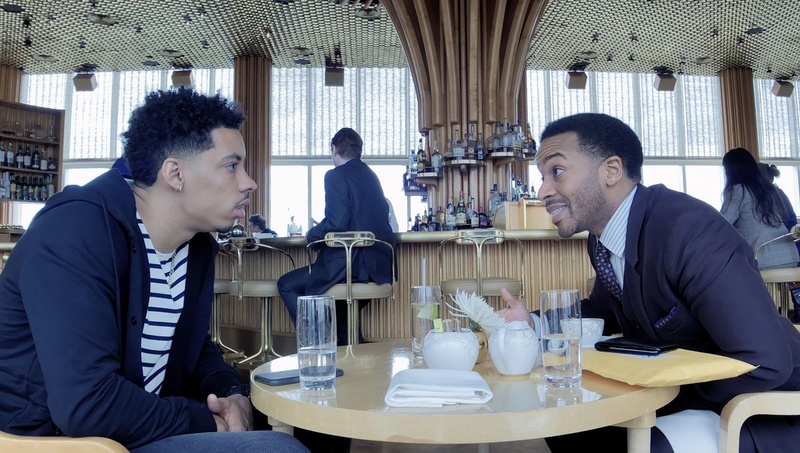 There are fewer moments in “High Flying Bird” where the viewer is reminded this is an iPhone movie than in “Unsane.” iPhone technology and knowing how to use it is something the Oscar-winning director has certainly mastered in a way that almost feels un-challenging compared to what other directors are doing. However, this story told from anyone else’s perspective would have been an entirely different, perhaps more interesting project altogether. "High Flying Bird" won’t captivate non-sports fans.